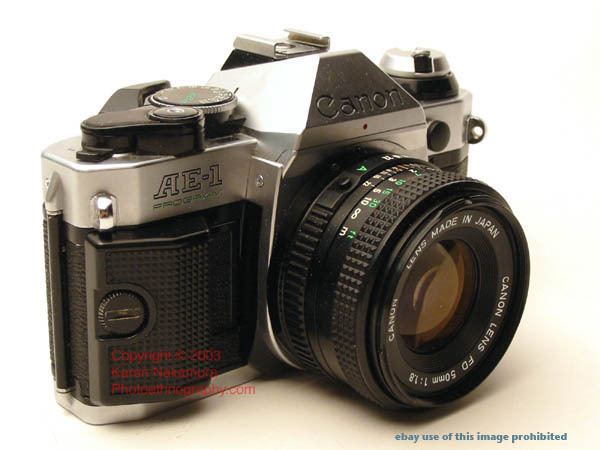 The Canon AE-1 Program is an advanced manual focus SLR produced by Canon, Inc. between 1981 and 1987. It features through the the lens (TTL) full aperture metering and shutter priority metering. The AE-1 Program can take the entire Canon FD series of bayonet mount lenses (which can be bought very inexpensively on ebay at a fraction of the EOS equivalents) as well as most FL and non-FD lenses. It has AE-lock, exposure compensation, multiple exposure ability, and depth of field preview features. It was leaps ahead of any of its Nikon counterparts at the time. Using the text or images on this website without permission on an ebay auction or any other site is a violation of federal law. Read Mir.com's Classic SLR Series report on the AE-1 Program. 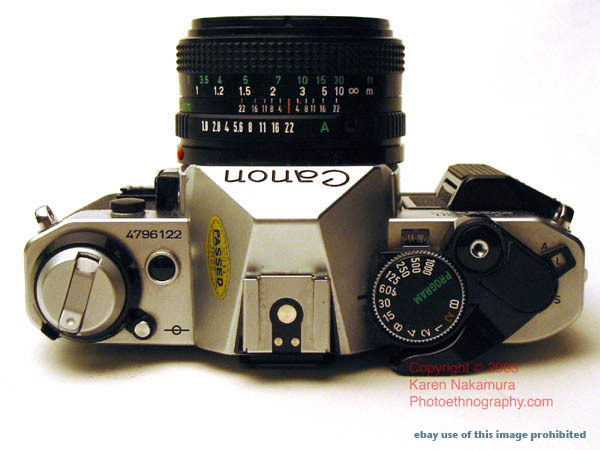 This page also has a full manual on how to use the AE-1. KJSL calls it one of the most popular amateur cameras of all time. 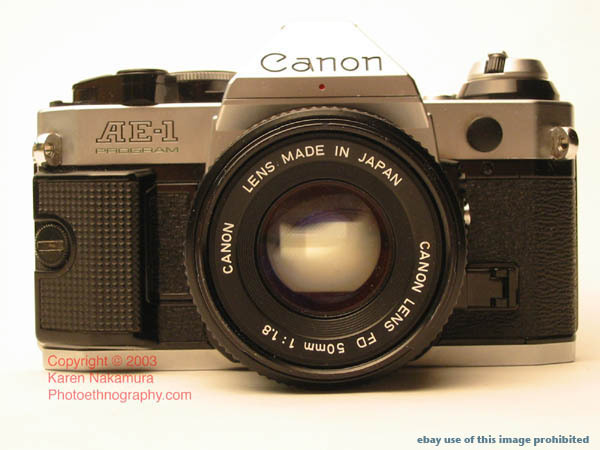 You also have to check out the Canon Museum's AE-1 Program page. It features a cool 3D rotating display of the camera as well as advertisements of the time. I have to agree with the above reports. I teach college photoethnography and the AE-1 is definitely a camera that I would be happy if my students bought. It meets all the requirements of photography classes. It has full-manual metering as well as the convenience of shutter priority priority metering. There's even full-program "point and shoot" (well, focus first) mode. The focusing screen is very bright and the split-screen focusing aid is very accurate. Best of all, the AE-1 is inexpensive and its lenses are also inexpensive. You could put together an entire AE-1 Program kit (35mm / 50mm / 135mm) for the cost of a Canon EOS Rebel body alone. The AE-1 Program (serial #479612x) that I sold a while ago on ebay was in pristine mint condition.The AE-1 Program was built as late as 1987. I have the feeling this is a late-model because it is so clean. There were almost no wear marks visible anywhere on the camera (except for the bottom plate, just your usual rub marks). The AE-1 Program uses a 6V PX28A alkaline battery that you can get at any major drugstore, Radio Shack, or camera store. This is an excellent camera for a student or as the second body of a professional who uses the FD system (which includes the excellent F-1). 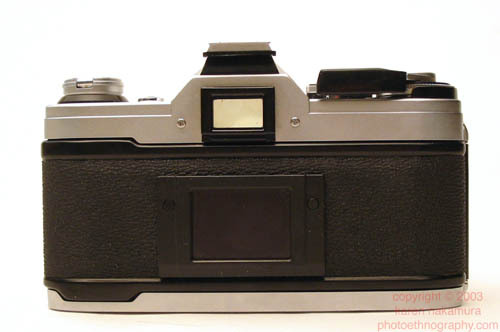 It was is perhaps the lightest of the metal-clad Canon FD body (ie, before Canon moved fully to polycarbonates in the T-series). If you want a slightly more sophisticated camera that uses the FD mount, look at the Canon A-1 which is the professional model in the Canon A series. Canon offered a variety of optional accessories which are often listed on ebay. They include the Canon Speedlite flashes which offer full automatic exposure as well as the power winder unit which turns the camera into a motor driven powerhorse. Using the text or images on this website without permission on an ebay auction or any other site is a violation of federal law. Fixed eye-level pentaprism. 0.86x magnification (EX 50mm), 93.5% vertical coverage, 96% horizontal coverage. Split-image rangefinder encircled by microprism rangefinder at center with a fresnel matte screen.